Today is the eighth month’s ninth day, which mean this site celebrates 1989, the greatest year in video game history*! This site even has a sub-section dedicated to the year for reasons you’ll see mentioned there. Then again, you’ll probably figure out why once you see all the stuff I’m celebrating (and there’s still a lot left out). Everything in this update is linked to that magical year when many of this site’s favorite games, series, consoles and more debuted. Unfortunately, there’s so much stuff that I couldn’t even fit it into 3 screenshots, so, as a first, the sprite preview is a video! – Capcom: Quick Man added to Mega Man section. – – Final Fight: two new scratch-made Cody sprites! – Sunsoft: Tuff Turf’s heroes and lady added. – Games(other): Prince of Persia (original) added. – Music: new gallery starts with new Chuck D (Public Enemy) sprite and older sprites and sprite edits. – Toys ‘n Toons: Marge, Lisa and Bart Simpson. The Simpsons cartoon started in 1989! Mini-Logos: Prince of Persia (Jordan Mechner), Public Enemy (Music) and the Simpsons (Television) added. The new custom sprites and mini-logos have been added to the GFX Generators. My apologies to any fans of 1989 games who were left out, like Mendel Palace/Quinty, Double Dragon 2(NES), Astyanax, Crime City, and dozens more. There are too many good 1989 games to celebrate and many of my older sprites needed to be redone. Let me know about your favorite 1989 games and characters in the comment section! * – 1989 being the greatest game year is hyperbole mostly for fun, but also designed to drive disagreement-induced hits, but at least this website admits it. Thanks the SDCC exclusive NECA figure sets for Konami-style Ninja Turtles, the new TMNT game developed by Platinum and the X-Men getting a new movie, it’s a pretty good time to be a mutant. That’s why this update is happening! 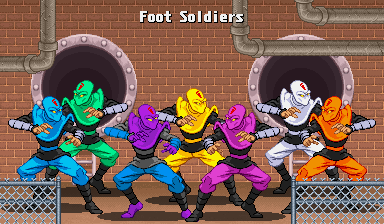 TMNT – new sprites of all four turtles, an improved version of the Foot Soldier sprite from a few weeks ago and a new pose. Marvel – improved versions of the Storm and Dazzler from the FCBD update and plus a new outfit for each in that same pose. All new pixel art has been added to the GFX Generators. 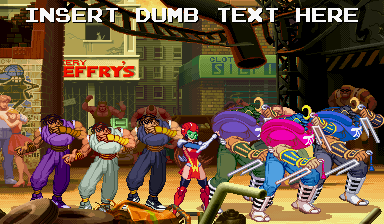 The Foot Soldier’s palette has been reworked so that the ’80s toy palette fits in, so it’s all one sprite now. You’ll also find a nice new screenstyle in the Group Maker generator. Saturday is Free Comic Book Day and it’ll be a good time to support your local comic book shop! Remember: they have to pay for the free books you get, so please consider buying a few comics, too! I’ll be spending my FCBD at the Warren, Ohio location of All-American Comics (Facebook, GoogleMaps) selling prints, giving out free coloring pages and, really, just hanging out. 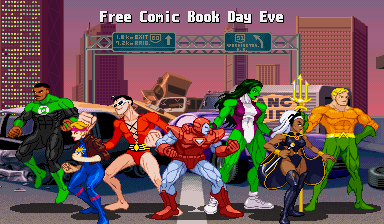 This site is celebrating FCBD by throwing a lot of comic book sprites at you (and this site is free, too)! DC Comics: Aquaman, Bizarro (Silver Age), GL John Stewart, Plastic Man (celebrating his 75th anniversary this week), and Ultraman. Additions were made to the Superman Battle Hover (a.k.a. the Taito pose) gallery. the new items were added to the V.1 Vs. and Group GFX Generators. 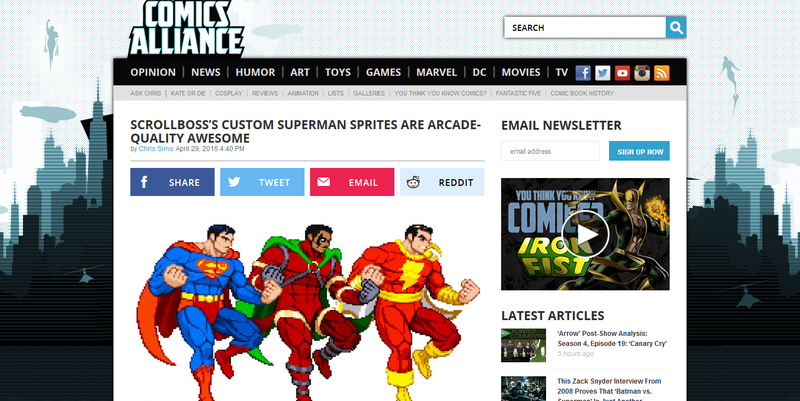 Comics Alliance’s Chris Sims posted a story about the Superman Taito pose sprites I’ve been making. Including a short story about the first time he saw the arcade game and how fans (myself included) kept wondering about a certain palette swap from the game. That game was special for a lot of comic book and video game fans of the 1980s, especially when we heard that John Williams Superman theme cut through the other sounds bouncing off the walls of the arcade. Thanks, Mr. Sims! 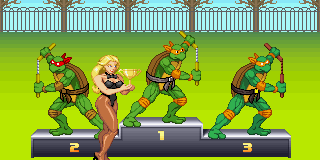 All four Teenage Mutant Ninja Turtles now have SFA3 portraits. 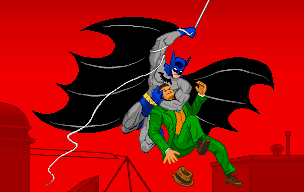 the improved Detective Comics #27 sprite is now in the DC Gallery. 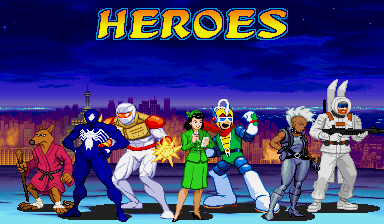 edit: along with forgetting to mention that I’d updated the Crime Fighters entry in the Game Index last week, this week’s update adds a few more sprites, including the third boss’ intro and the seventh boss’ tribute to Platoon. 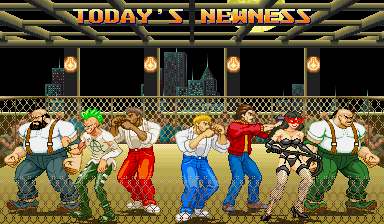 – Konami: Crime Fighters hero added along with mohawk and domme enemies. – Capcom: Final Fight’s heavyweights added. – Taito: Tony Gibson (Crime City) added. Bad News: those portrait/s I teased on Tumblr over a week ago aren’t in this update. Good News: I saved them for a semi-themed update for next week. They’ll appear along with a very timely sprite. You’ll also see a better version of the sprite in this post added to the site then, too. Treachery in Beatdown City, the tactical beat ’em up with an 8-bit look, has been relaunched on Kickstarter, so help out if you can! 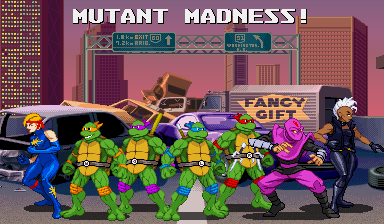 GroupShot: All 12 TMNT Tournament Fighters (SNES) stages were added to the “Boxes, Flyer & Posters 160×192,” “Avatar 100×100,” and “Comics 88×136 pixels” styles in the GroupShot Generator. X-Men vs. Street Fighter (Capcom Secret Files) added to the 88×136 comic cover styles. 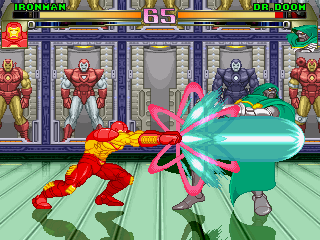 Custom Sprites – The sprites added to the generators have all been added to their respective Marvel, and galleries. 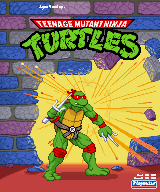 TMNT – TMNT arcade sprites added. Animated fighting stances of all 12 characters from Tournament Fighters (SNES) sprites added. 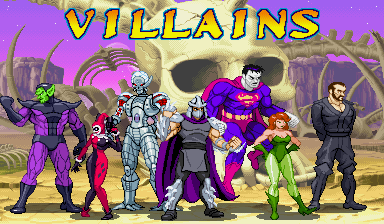 Mini-Logos – Bizarro (’80s), Brainiac (’80s), Despero (’90s), Lois Lane (original, early ’70s), Mera (’80s) added to DC. Iron Man (Heroes Return) added to Marvel. 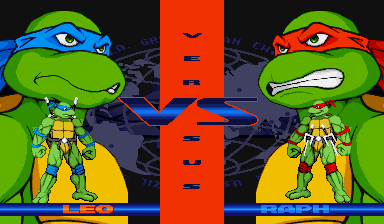 Game Logos – TMNT Tournament Fighters (various versions) and Batman: Return of the Joker (NES) added. Game Index – Captain America and the Avengers (Genesis), Spider-Man & the X-Men (SNES), TMNT IV (SNES) and Trojan (NES) added. Vernacula-X – A few more terms were added and a few more terms were expanded. 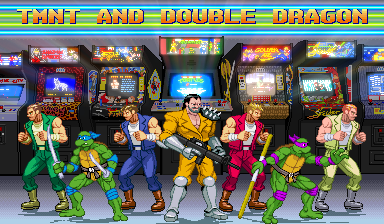 1-UP, Versus Mode and Palette Swap were the most improved and now have small sprite or screenshot galleries.